February was a big month for Kickstarter. Not only did they have a number of record-breaking projects, but they were shoved into the mainstream consciousness with a flood of traditional news coverage. But there was always the question of whether these thousands of pledges would have any lasting effect on the site. Could such a rush of attention actually have negative effects, increasing competition and bringing in more projects than the site’s population of donors can handle? Fortunately, that doesn’t seem to have been the case. The site’s big month appears to have made a lasting increase in both projects, users, and funding. There are a ton of details at Kickstarter’s blog post, but the gist is this: the two biggest projects lately, Double Fine Adventure and Order of the Stick, brought in millions of dollars themselves, but have also produced a halo of funding where there was very little before. In the gaming category, for instance, only one project had reached $100,000 in funding before last month. Since then nine have. And in webcomics, where the Order of the Stick book was categorized, the number of pledges per week, on average, has doubled. They’re not just staying in the original category, either: 22% of each group of original backers have been busy in other categories, backing nearly 2000 projects with over $1m all told. Many of the backers were on Kickstarter for the first time to back the big projects, and these big names on the marquee ended up working as advertisements for the site itself as well. It just goes to show that crowd-funding is a space with a ton of room to grow as new models and ideas are found to be applicable. 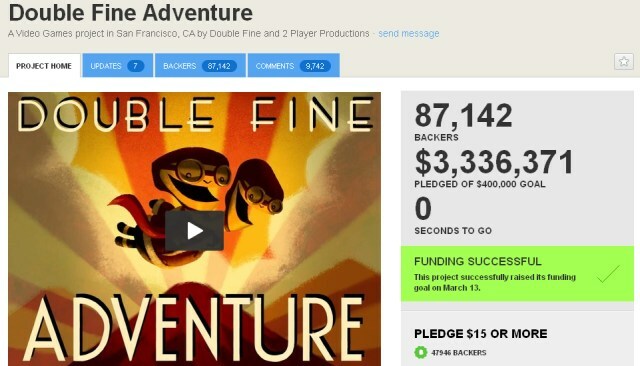 Before last month, many would have thought that raising millions via Kickstarter was a fantasy. But the scale of the site is growing and naysayers are constant casualties. What remains to be seen is how long Kickstarter itself can remain on top. Just as it brought a change to the world of funding and launching products, another could bring yet more changes to the still-nascent field of crowd-funding.